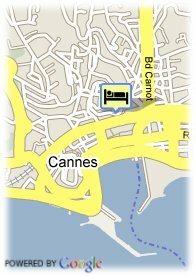 47, Avenue de Grasse, 06400 Cannes, France. 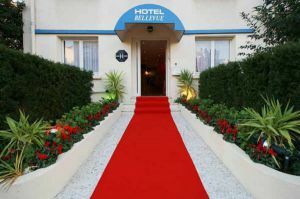 A lovely, charming hotel situated at 5 minutes from the Palais des Festivals, at 5 minutes from the station and at 15 minutes by car from Nice Côte d'Azur Airport. Serenity for a cosy hotel in the heart of Cannes city, calm and peace in front of the hill called the Suquet. The muffled atmosphere of the nice residences and mansions. Soundproof bedrooms with air conditioning, TV and WiFi Internet. Breakfast at the sunny terrace or in the bedroom. A quiet place in city center. Near exhibion centre, Near trainstation, Centre, Harbour, Near the historic centre.